Until the middle of this century, the Western world knew little about the peoples of the Central Highlands of what is now Papua New Guinea, and vice versa. Only in 1930 was the curtain abruptly lifted on those valleys and mountain ridges, with their tens of thousands of inhabitants whose mineral resources, service as laborers, fealty as colonial subjects, and souls became objects of intense interest on the part of gold prospectors, Australian administrative officers, and missionaries. For the most part, these early interlopers were mere sojourners, and all were too preoccupied with their immediate objectives to learn or report much about the lives of people whose very existence had only recently been suspected. Within the general framework of how and why they conducted their early Highlands fieldwork, but with the freedom to develop their essays as they chose, potential contributors were asked to reflect on a range of interrelated topics: Before the Highlands: training and theoretical orientation prior to the experience; previous fieldwork; why the Highlands and a particular region were chosen; expectations and preparation. Arrival: first impressions of the region and the people; the colonial encounter; selecting and establishing a field base; hosts' reactions and expectations; hosts' understandings of the fieldworker's objectives. Fieldwork: logistics of living in the field; relationships with administrators and/or missionaries; the role of the anthropologists in the community; what the community gained from the ethnographer's presence; methods employed. Analysis: how the anthropological climate of the times shaped or influenced analyses; how the Highlands experience may have changed the author's theoretical orientation. After the Highlands: how return visits or later work has been influenced by the first encounter; how the early work relates to issues subsequently prominent in Highlands ethnography or anthropology in general. 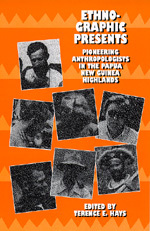 Terence E. Hays is Associate Professor (Anthropology), Department of Anthropology and Geography, Rhode Island College, Providence, RI.